For the second part of our seven part series, we are going to focus on the Boerboel. I was offered a while back an opportunity to do some Boerboel breeding. I have not taken the offer to this point, but I must say these pups are a hoot! The following is some general breed information. The Boerboel (a.k.a. 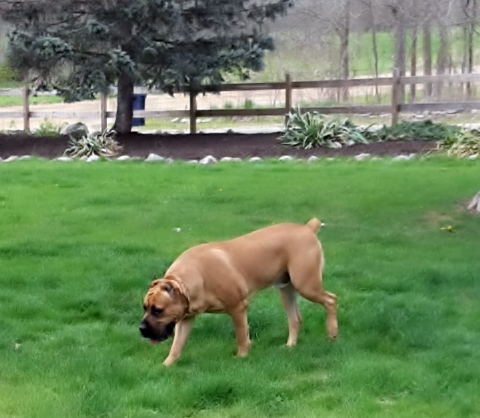 African Boerboel, South African Boerboel, South African Mastiff) is a 2015 addition to the AKC registry. The Boerboel originated in South Africa as a working farm dog in the 17th century. Their purpose was to protect against predators as well as tracking wounded game. They are a strong and courageous dog. The breed is still rare in The States but has gained some popularity. They are loving and playful with their owners. They are still fiercely protective today. In physical appearance, they are a very balanced and square dog. According to the AKC breed standards, the origin and purpose of the Boerboel should be understood in order to preserve the unique identity and qualities of the breed as a South African developed mastiff. The Boerboel is a large dog that is strong, confident and muscular in appearance with powerful, free-flowing movement. When observing a Boerboel at play or work, standing or moving, it should show strength, suppleness, nimbleness and agility. The Boerboel is reliable, obedient and intelligent, with strong watch and guard-dog instincts. It is self-assured and fearless. The Boerboel is very playful and affectionate toward its owner. The Boerboel is a generally healthy breed. They can suffer from hip/elbow dysplasia, vaginal hyperplasia, ectropion and entropion. They require a moderate exercise routine. Minimal grooming requirements due to its short coat.